Publius (or Gaius) Cornelius Tacitus (c. 56 C.E. – c. 117 C.E.) was one of the important historians of Roman antiquity. The surviving portions of his two major works, the Annals and the Histories, deal with the reigns of the Roman Emperors Tiberius, Claudius, Nero and those who reigned in the Year of the Four Emperors. These two works span the history of the Roman Empire from the death of Augustus in 14 C.E. to (presumably) the death of emperor Domitian in 96 C.E. Other surviving works by Tacitus include Oratory (Dialogus de oratoribus), Germania (in De origine et situ Germanorum) and biographical notes about his father-in-law Agricola, primarily during his campaign in Britannia (De vita et moribus Iulii Agricolae). Tacitus’ work has been read for centuries for its moral instruction, gripping and dramatic narrative, and inimitable prose style. It is as a political theorist, though, that he has been most influential outside the field of history. While recognizing the need for a leader with strong, centralized control to maintain political harmony, Tacitus illustrated the dangers of a tyrannical leader and a weak hypocritical Senate. Because Tacitus refused to take a firm position, scholars have interpreted his work both in support of republican ideals ("red Tacitists" ) and as a lesson in Machiavellian realpolitik ("black Tacitists"). Tacitus' style in his major works is annalistic. An author of the latter part of the Silver Age of Latin literature, his writing is characterized by an uncompromising boldness and sharpness of wit, and a compact and sometimes unconventional use of the Latin language. Although Tacitus' works contain a wealth of information about the society in which he lived, details of his own life are scarce. What little is known comes from scattered hints throughout the corpus of his work, the letters of his friend and admirer Pliny the Younger, an inscription found at Mylasa in Caria, and educated guesswork. 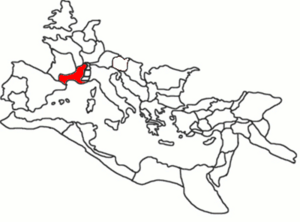 Tacitus is thought to have come from Gallia Narbonensis. Tacitus' scorn for social climbers has led to the supposition that his family was from an unknown branch of the patrician gens Cornelia, but no Cornelii had ever borne the name Tacitus. Furthermore, the older aristocratic families had largely been destroyed during the proscriptions at the end of the Republic, and Tacitus himself is clear that he owes his rank to the Flavian emperors (Hist. 1.1). The supposition that he descended from a freedman finds no support apart from his statement, in an invented speech, that many senators and knights were descended from freedmen (Ann. 13.27), and is easily dismissed. His father may have been the Cornelius Tacitus who was procurator of Belgica and Germania; however, a son of this Cornelius Tacitus is mentioned by Pliny the Elder as exhibiting abnormally rapid growth and aging , and implies an early death. This means that this son was not Tacitus, but his brother or cousin; the senior Cornelius Tacitus may have been an uncle, rather than his father. From this connection, and from the well-attested friendship between the younger Pliny and the younger Tacitus, scholars draw the conclusion that the two families were of similar class, means, and background: equestrians, of significant wealth, from provincial families. The exact province of his origin is unknown. His marriage to the daughter of the Narbonensian senator Gnaeus Julius Agricola may indicate that he, too, came from Gallia Narbonensis. The possible Spanish origin of the Fabius Iustus to whom Tacitus dedicates the Dialogus suggests a connection to Hispania. His friendship with Pliny points to northern Italy as his home, but none of this evidence is conclusive. Gnaeus Julius Agricola could have known Tacitus from elsewhere. Martial dedicates a poem to Pliny , but not to the more distinguished Tacitus, which, had Tacitus been Spanish, might be unusual. However, no evidence exists that Pliny's friends from northern Italy knew Tacitus, nor do Pliny's letters ever hint that the two men came from the same province . The strongest piece of evidence that he was not from Italy is found in Book 9, Letter 23, which reports how Tacitus was asked if he were Italian or provincial, and upon giving an unclear answer, was further asked if he were Tacitus or Pliny. Since Pliny was from Italy, this indicates that Tacitus must have been from the further provinces, and Gallia Narbonensis is the most likely candidate. Tacitus’ ancestry, his skill in oratory, and his sympathetic depiction of barbarians who resisted Roman rule , have led some to suggest that he was of Celtic stock: the Celts had occupied Gaul before the Romans, were famous for their skill in oratory, and had been subjugated by Rome. 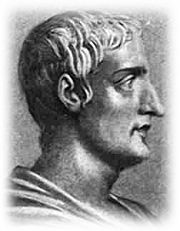 As a young man Tacitus studied rhetoric in Rome as preparation for a career in law and politics; like Pliny, he may have studied under Quintilian. In 77 or 78 he married Julia Agricola, daughter of the famous general Agricola; nothing is known of their marriage or their home life, save that Tacitus loved hunting and the outdoors. He owed the start of his career (probably meaning the latus clavus, mark of the senator) to Vespasian, as he says in the Histories (1.1), but it was under Titus that he entered political life as quaestor, in 81 or 82. He advanced steadily through the cursus honorum, becoming praetor in 88 and holding a position among the quindecemviri sacris faciundis, members of a priestly college in charge of the Sibylline Books and the Secular Games. He gained acclaim as a lawyer and orator. [Agricola] was spared those later years during which Domitian, leaving now no interval or breathing space of time, but, as it were, with one continuous blow, drained the life-blood of the Commonwealth…. It was not long before our hands dragged Helvidius to prison, before we gazed on the dying looks of Manricus and Rusticus, before we were steeped in Herennius Senecio's innocent blood. Even Nero turned his eyes away, and did not gaze upon the atrocities which he ordered; with Domitian it was the chief part of our miseries to see and to be seen, to know that our sighs were being recorded…. From his seat in the Roman Senate he became suffect consul in 97, during the reign of Nerva, being the novus homo (first of his family) to do so. During his tenure he reached the height of his fame as an orator when he delivered the funeral oration for the famous old soldier Lucius Verginius Rufus. In the following year he wrote and published Agricola and Germania, embarking on the literary endeavors that would occupy him until his death. Afterwards he disappeared from the public scene, returning to it during Trajan's reign. In 100, he, along with his friend Pliny the Younger, prosecuted Marius Priscus (proconsul of Africa) for corruption. Priscus was found guilty and sent into exile; Pliny wrote a few days later that Tacitus had spoken "with all the majesty which characterizes his usual style of oratory". During the lengthy absence from politics and law which followed, he wrote his two major works: first the Histories, then the Annals. He held the highest civilian governorship, that of the Roman province of Asia in Western Anatolia, in 112 or 113, according to the inscription found at Mylasa (mentioned above). A passage in the Annals fixes 116 as the terminus post quem of his death, which may have been as late as 125One writer makes a case against this traditional interpretation, e.g., F.R.D. Goodyear . It is unknown whether he was survived by any children, though the Augustan History reports that the emperor Marcus Claudius Tacitus claimed him as an ancestor and provided for the preservation of his works; like so much of the Augustan History, this story is probably a fabrication. 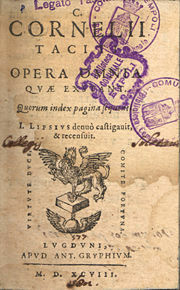 The front page of Justus Lipsius's 1598 edition of the complete works of Tacitus, bearing the stamps of the Bibliotheca Comunale in Empoli, Italy. Large portions of five works ascribed to Tacitus have survived. Dates are approximate, and the last two (his "major" works), took several years to write. Tacitus’ two major works, originally published separately, were meant to form a single edition of 30 books, with the Annals preceding the Histories. The Histories was written before the Annals; it appears that after completing the Histories, Tacitus felt the need to probe the past and interpret the causes of Rome’s political crises. The two books formed a continuous narrative of the era from the death of Augustus (14) to the death of Domitian (96). Though parts have been lost, what remains is an invaluable historical record of that period. In one of the first chapters of the Agricola, Tacitus said that he wished to speak about the years of Domitian, of Nerva, and of Trajan. In the Historiae the project was modified: in the introduction, Tacitus said that he would deal with the age of Nerva and Trajan at a later time. Instead, he would cover the period that started with the civil wars of the Year of Four Emperors and ended with the despotism of the Flavian Dynasty. Only the first four books and 26 chapters of the fifth book have survived, covering the year 69 and the first part of 70 C.E. The work is believed to have continued up to the death of Domitian on September 18, 96. The fifth book contains, as a prelude to the account of Titus's suppression of the Great Jewish Revolt, a short ethnographic survey of the ancient Jews and is an invaluable record of the attitude of educated Romans towards them. In the first book of the Historiae, a speech put in the mouth of Galba establishes Tacitus' ideological and political position. Tacitus was sure that only a principatus (the "prince," or monarchical emperor) could maintain peace, the fidelity of the armies, and the cohesion of the empire. Discussing Augustus Caesar's rise to power, Tacitus says that after the battle of Actium, the unification of the power in the hands of a prince was necessary to keep the peace. The prince ought not to be a tyrant, like Domitian, nor a fool, like Galba. He should be able to keep the imperium safe, while protecting the prestige and the dignity of the Roman Senate. Galba's preoccupation with formality and lack of political realism rendered him unable to control events. In contrast, for his successor Nerva adopted Trajan, a general who was able to keep the legions unified and the army out of imperial politics, and to stop disorder among the legions, preventing rival claims to the throne. Tacitus, without any illusions, considered the rule of the adoptive Emperors the only possible solution to the problems of Empire. Tacitus wrote from the point of view of an aristocrat, showing fear, mixed with disdain, for the soldiers' tumult and for the rabble of the capital. He also held in low esteem those hypocritical members of the Senate, who maintained a public image of strength and dignity while showing servility towards the Emperor. The style of narration is rapid, reflecting the speed with which the historical events took place and allowing little digression. Often a story was divided into single scenes create a dramatic narration. Tacitus is a master at depicting both masses of people and individuals, alternating short and sharp notations with detailed portraits. The Annals was Tacitus' final work, covering the period from the death of Augustus Caesar in the year 14. He wrote at least sixteen books, but books 7-10 and parts of books 5, 6, 11 and 16 are missing. Book 6 ends with the death of Tiberius and books 7-12 presumably covered the reigns of Caligula and Claudius. The remaining books cover the reign of Nero, perhaps until his death in June 68 or until the end of that year, to connect with the Histories. The second half of book 16 is missing (ending with the events of the year 66). We do not know whether Tacitus completed the work or whether he finished the other works that he had planned to write; he died before he could complete his planned histories of Nerva and Trajan, and no record survives of the work on Augustus Caesar and the beginnings of the Empire with which he had planned to finish his work as a historian. The Annals was written to explain how Rome arrived at the political circumstances described in the Histories, and to document the loss of Roman political freedom. At the beginning of Annals, Tacitus accepts the necessity of strong, centralized control to maintain the unity of the Roman Empire, but contends that the system must allow for good and capable leaders to rise to power, instead of perpetuating corrupt dynastic rule. Tacitus shows us the tragedy of the people, bringing to light their passions and ambiguities. All the social classes, without exception, have the defects of ambition, desire for power, desire for social status, and often envy, hypocrisy, and presumption. In the Annals, Tacitus further improved the style of portraiture that he had used so well in the Historiae. Perhaps the best portrait is that of Tiberius, painted indirectly and progressively during the course of a narrative, with observations and commentary providing details. Tacitus on Jesus: a well-known passage from the Annals mentions the death of Christ (Annals, xv 44). Tacitus also wrote three minor works on various subjects: the Agricola, a biography of his father-in-law Gnaeus Julius Agricola; the Germania, a monograph on the lands and tribes of barbarian Germania; and the Dialogus, a dialogue on the art of rhetoric. The Germania (Latin title: De Origine et situ Germanorum) is an ethnographic work on the diverse set of Germanic tribes outside the Roman Empire. Ethnography had a long and distinguished heritage in classical literature, and the Germania fits squarely within the tradition established by authors from Herodotus (c. 484 –c. 425 B.C.E.) to Julius Caesar. Tacitus himself had already written a similar but shorter piece in Agricola (chapters 10–13). The book begins with a description of the lands, laws, and customs of the Germans (chapters 1–27); it then goes into descriptions of individual tribes, beginning with those dwelling closest to Roman lands and ending on the uttermost shores of the Baltic Sea, with a description of the primitive and savage Fenni and the unknown tribes beyond them. The Agricola (written ca. 98 C.E.) recounts the life of Gnaeus Julius Agricola, an eminent Roman general and Tacitus' father-in-law; it also covers, briefly, the geography and ethnography of ancient Britain. As in the Germania, Tacitus favorably contrasted the liberty of the native Britons to the corruption and tyranny of the Empire; the book also contains eloquent and vicious polemics against the rapacity and greed of Rome. The date of the Dialogus de oratoribus remains uncertain, but it was probably written after the Agricola and the Germania. Many characteristics set it apart from the other works of Tacitus, so much so that its authenticity may be questioned, even if it is always grouped with the Agricola and the Germania in the manuscript tradition. The way of speaking in the Dialogus seems closer to Cicero's style, refined but not prolic, which inspired the teaching of Quintilian; it lacks the incongruities typical of Tacitus' major historical works. It may have been written when Tacitus was young; its dedication to Fabius Iustus would thus give the date of publication, but not the date of writing. More probably, the unusually classical style may be explained by the fact that the Dialogus is a work dealing with rhetoric. For works in the rhetoric genre, the structure, the language, and the style of Cicero were the usual models. Tacitus used the official sources of the Roman state: the acta senatus (the minutes of the session of the Senate) and the acta diurna populi Romani (a collection of the acts of the government and news of the court and capital). He read collections of the speeches of emperors, such as Tiberius and Claudius. Generally, Tacitus was a scrupulous historian who paid careful attention to historical detail. The minor inaccuracies in the Annals may be due to Tacitus dying before proofreading this work. He freely used a variety of historical and literary sources, and he chose from sources with varying opinions. Tacitus cites some of his sources directly, among them Pliny the Elder, who had written Bella Germaniae and a historical work which was the continuation of that of Aufidius Bassus. Tacitus used some collections of letters (epistolarium) and various notes, and also took information from exitus illustrium virorum, a collection of books by critics of the emperors. They tell of the sacrifices of martyrs to freedom, especially the those who committed suicide, following the theory of the Stoics. While he placed no value on the Stoic theory of suicide, Tacitus used accounts of famous suicides to add drama to his stories. Though these suicides seemed, to him, ostentatious and politically useless, he gave prominence to the speeches of some of those about to commit suicide, for example Cremutius Cordus' speech in Annals IV, 34-35. Tacitus' writings are known for their incisive and dense prose, in contrast to the more pleasing style of some of his contemporaries, like Plutarch. Describing a near defeat of the Roman army in Ann. I, 63 Tacitus does euphemize, more by the brevity with which he describes the end of the hostilities, than by embellishing phrases. In most of his writings he keeps to a chronological ordering of his narration, with only an occasional reference to the broader picture, leaving the reader to piece together the background for himself. When he did sketch the background, for example, in the opening paragraphs of the Annals, summarizing the situation at the end of the reign of Augustus, he used a few condensed phrases to take the reader to the heart of the story. Tacitus achieved his unique stylistic imprint through the use of rare and otherwise unique grammatical forms, frequent ellipsis (especially of auxiliary forms of 'esse'), inventive circumlocution, and diction which extends to the known limits of the Latin lexicon. In comparison to the Historiae, the Annales are less fluid, more concise and severe. The unharmonious verbal forms reflect the discordant events and the ambiguity of the characters' behavior, and there are many violent metaphors and audacious uses of personification. Poetic styles, especially that of Virgil (c. 70 - 19 B.C.E. ), are often used. For example, the description of Germanicus's foray onto the field of the Battle of the Teutoburg Forest in search of the destroyed legions of Varus follows the style of Virgil's description of Aeneas's descent into the underworld. Tacitus' historical style combined various approaches to history into a method of his own (somewhat resembling that of Sallust); he seamlessly blended straightforward descriptions of events, pointed moral lessons, and tightly-focused dramatic accounts. His historiography contained deep, and often pessimistic, insights into the workings of the human mind and the nature of power. inde consilium mihi … tradere … sine ira et studio, quorum causas procul habeo. Hence my purpose is to relate … without either anger or zeal, from any motives to which I am far removed. In spite of this declaration of his intention to be objective, there has been much scholarly discussion about Tacitus' apparent "partiality" to some of his subjects. Throughout his writings, Tacitus appears primarily concerned with the balance of power between the Roman Senate and the Roman Emperors. His writings are filled with tales of corruption and tyranny among the governing class of Rome as they failed to adjust to the new imperial régime; they betrayed their cherished cultural traditions of free speech and self-respect in their efforts to please the often bemused and tyrannical emperors. Another recurring theme is the support of factions of the army in bringing an Emperor to power and maintaining him there; throughout the period Tacitus is describing, the leading role wavered between some of the legions defending the outer borders of the Empire, and the troops residing in the city of Rome, most prominently the Praetorian Guard. Tacitus' political career was largely under the emperor Domitian; his experience of the tyranny, corruption, and decadence prevalent during that era (81 - 96 C.E.) may explain his bitter and ironic political analysis. He warned against the dangers of power without accountability, and love of power untempered by principle; and against the apathy of the people and the corruption, engendered by the wealth of the Roman Empire, which accommodated tyranny. Tacitus’ experience of Domitian's tyrannical reign is also seen as the reason for his sometimes unfairly bitter and ironic portrayal of the Julio-Claudian emperors. The image that Tacitus builds of Tiberius throughout the first six books of the Annals is neither exclusively bleak nor approving: most scholars consider the image of Tiberius to be predominantly positive in the first books, and to become predominantly negative in the following books which relate the intrigues of Sejanus. The story of the entrance of Tiberius in the first chapters of the first book is tempered by the hypocrisy surrounding a new emperor coming to power; and in the later books Tacitus, though critical, appears to respect the wisdom and cleverness of the old emperor, who kept away from Rome in order to secure his position. Tacitus does not hesitate to use both praise and criticism in describing the same person, often explaining openly which qualities he thinks are commendable and which he considers despicable. His tendency to neither side with nor against the persons he describes led some later scholars to interpret his works as a defense of the imperial system, while others saw it as a rejection of the imperial system. 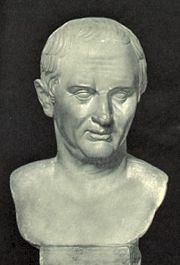 No other author of Latin prose, except perhaps Cicero, is considered equal to Tacitus. His style differs both from the prevalent style of the Silver Age of Latin literature and from that of the Golden Age of Latin literature; though his writing has a calculated grandeur and eloquence (evidence of Tacitus' education in rhetoric), it is extremely concise, even epigrammatic. The sentences are rarely flowing or beautiful, but their point is always clear. The same style has been both derided as "harsh, unpleasant, and thorny" and praised as "grave, concise, and pithily eloquent." Tacitus’ historical works focus on the psyches and inner motivations of the characters, often with penetrating insight; sometimes it is questionable whether his insight is convincing because of its accuracy, or only because of his rhetorical skill. He is at his best when exposing hypocrisy and dissimulation; for example, he follows a narrative recounting Tiberius' refusal of the title pater patriae by recalling the institution of a law forbidding any "treasonous" speech or writings, and the frivolous prosecutions which resulted (Annals, 1.72). Elsewhere (Annals 4.64–66) he compares Tiberius' public distribution of fire relief to his failure to stop the perversions and abuses of justice which he had begun. Tacitus owes the most, both in language and in method, to Sallust (86 - 34 B.C.E. ); Ammianus Marcellinus (fourth cen.) is the later historian whose work most closely approaches him in style. Tacitus is remembered as Rome's greatest historian, the equal, if not the superior, of Thucydides, the foremost historian of ancient Greece. His influence extends far beyond the field of history. His work has been read for its moral instruction, its gripping and dramatic narrative, and its inimitable prose style. It is as a political theorist, though, that he has been most influential outside the field of history. The political lessons taken from his work fall roughly into two divisions (as identified by Giuseppe Toffanin): the "red Tacitists," who used him to support republican ideals, and the "black Tacitists," those who read him as a lesson in Machiavellian realpolitik. Though the works of Tacitus are the most reliable source for the history of his era, their factual accuracy is occasionally questioned; the Annals are based in part on secondary sources of unknown reliability, and there are some obvious minor mistakes (for instance confusing the two daughters, both named Antonia, of Mark Antony and Octavia Minor). The Histories, written from primary sources and an intimate personal knowledge of the Flavian period, is thought to be more accurate, though Tacitus' hatred of Domitian seemingly colored its tone and interpretations. ↑ Orientis Graeci Inscriptionis Selectae 487, first brought to light in Bulletin de correspondance hellénique (Paris: 1890): 621–623. ↑ Since he was appointed to the quaestorship during Titus's short rule (see note below) and 25 was the minimum age for the position, the date of his birth can be fixed with some accuracy. ↑ See: Revilo P. Oliver, "The First Medicean MS of Tacitus and the Titulature of Ancient Books." Transactions and Proceedings of the American Philological Association 82 (1951): 232–261, for an analysis of the manuscript from which the name Publius is taken; see also Oliver, "The Praenomen of Tacitus." The American Journal of Philology 98 (1): (Spring, 1977): 64–70, which examines the evidence for each suggested praenomen (the well-known Gaius and Publius, the lesser-known suggestions of Sextus and Quintus) before settling on Publius as the most likely. ↑ Oliver, 1977, 64-70, cites an article by Harold Mattingly in Rivista storica dell'Antichità 2 (1972): 169–185. ↑ Pliny's Natural History 7.76.Retrieved June 6, 2008. ↑ Clarence Mendell. Tacitus: The Man and His Work. (New Haven: Yale University Press, 1957), 7; Syme, 1958, 473. ↑ F.R.D. Goodyear. The Annals of Tacitus, vol. 2 (Cambridge: Cambridge University Press, 1981. Commentary on Annals 1.55-81 and Annals 2. 1981), 387-393. ↑ Augustan History, Tacitus X. Sidonius Apollinaris reports (Letters, 4.14; cited in Syme, 1958, 796) that Polemius, a fifth century Gallo-Roman aristocrat, descended from Tacitus, but this too, says Syme, is of little use. ↑ Jerome's commentary on the Book of Zechariah (14.1, 2; quoted in Mendell, 1957, 228) says that Tacitus's history was extant triginta voluminibus, (in thirty volumes). ↑ 7th Letter (to Tacitus), §33).thelatinlibrary. Retrieved June 5, 2008. Adams, James N. "The language of the later books of Tacitus' Annals." The Classical Quarterly 22 (1972): 350–373. Adams, James N. "The vocabulary of the speeches in Tacitus' historical works." Bulletin of the Institute of Classical Studies 20 (1973): 120–144. Adams, James N. "Were the later books of Tacitus' Annals revised?" Rheinisches Museum 117 (1974): 323–333. Barnes, T.D. "The Fragments of Tacitus' Histories." Classical Philology 72 (1977): 224–231. Barnes, T.D. "The Significance of Tacitus' Dialogus de Oratoribus." Harvard Studies in Classical Philology 90 (1986): 225–244. Barnes, T.D. "Tacitus and the Senatus Consultum de Cn. Pisone Patre." Phoenix 52 (1998): 125–148. Baron, Hans. The Crisis of the Early Italian Renaissance. Princeton, Princeton University Press, 1966. Birley, Antony R. "The Life and Death of Cornelius Tacitus." Historia 49 (2000): 230–247. Bosworth, A.B. "Mountain and molehill? Cornelius Tacitus and Curtius Rufus." The Classical Quarterly 54 (2004): 551–567. Brink, C.O. "Can Tacitus' Dialogus Be Dated? Evidence and Historical Conclusions." Harvard Studies in Classical Philology 96 (1994): 251–280. Brink, C.O. "Justus Lipsius and the text of Tacitus." The Journal of Roman Studies 41 (1951): 32–51. Clarke, Katherine. "An Island Nation: Re-Reading Tacitus' Agricola." The Journal of Roman Studies 91 (2001): 94–112. Daitz, S.G. "Tacitus' technique of character portrayal." The American Journal of Philology 81 (1960): 30–52. Damon, Cynthia. "The Trial of Cn. Piso in Tacitus' Annals and the Senatus Consultum de Cn. Pisone patre." The American Journal of Philology 120 (1) (1999): 143–162. Eck, Werner. "Cheating the Public, or: Tacitus Vindicated." Scripta Classica Israelica 21 (2002): 149–164. Fletcher, G.B.A. "Assonances or plays on words in Tacitus." The Classical Review, Vol. 54 (1940), pp. 184–187. Gill, C. "Character-development in Plutarch and Tacitus." The Classical Quarterly, Vol. 33 (1983), pp. 469–487. Ginsburg, Judith. Tradition and theme in the Annals of Tacitus. New York: Arno Press, 1981. Goodyear, F.R.D. The Annals of Tacitus, vol. 2 Cambridge: Cambridge University Press, 1981. Commentary on Annals 1.55-81 and Annals 2. Goodyear, F.R.D. "Development of language and style in the Annals of Tacitus." The Journal of Roman Studies 58 (1968): 22–31. Goodyear, F.R.D. "The readings of the Leiden manuscript of Tacitus." The Classical Quarterly 15 (1965): 299–322. Goodyear, F.R.D. Tacitus. Oxford: Clarendon Press, 1970., Greece & Rome New Surveys in Classics No. 4. Good survey of scholarship up to 1960s. Gordon, Mary L. "The Patria of Tacitus." The Journal of Roman Studies 26, Part 2 (1936): 145–151. Griffin, Miriam T. "Claudius in Tacitus." The Classical Quarterly 40 (1990): 482–501. Griffin, Miriam T. "The Lyons tablet and Tacitean hindsight." The Classical Quarterly 32 (1982): 404–418. Griffin, Miriam T. "Tacitus and Pliny." Scripta Classica Israelica 18 (1999): 139–158. Griffin, Miriam T. "Tacitus, Tiberius and the Principate," in I. Malkin and Z. Rubihnson (eds. ), Leaders and Masses in the Roman World: Studies in Honour of Zvi Yavetz. (Leiden: Brill, 1995. 33–57. Haverfield, F. "Tacitus during the Late Roman Period and the Middle Ages." The Journal of Roman Studies 6 (1916): 196–201. Krebs, Christopher B. Negotiatio Germaniae. Tacitus' Germania und Enea Silvio Piccolomini, Giannantonio Campano, Conrad Celtis und Heinrich Bebel. Hypomnemata 158. Göttingen: Vandenhoeck & Ruprecht, 2005. 284. ISBN 3525252579. Löfstedt, Einar. "The Style of Tacitus," in Idem, Roman Literary Portraits, transl. by P.M. Fraser. Oxford: Clarendon Press, 1958, 157–180. Marsh, Frank Burr. "Tacitus and aristocratic tradition." Classical Philology 21 (1926): 289–310. Martin, Ronald. "The Leiden manuscript of Tacitus." The Classical Quarterly 14 (1964): 109–119. Martin, Ronald. Tacitus. London: Batsford, 1981. Martin, Ronald. "Tacitus and the Death of Augustus." The Classical Quarterly 5 (1955): 123–128. Mattingly, H.B. "Tacitus' praenomen: the politics of a moderate." Rivista storica dell’antichità Vol. 2 (1972): 169–185. Miller, Norma P. "The Claudian Tablet and Tacitus: A Reconsideration." Rheinisches Museum 99 (1956): 304–315. Miller, Norma P. "Dramatic speech in Tacitus." The American Journal of Philology 85 (1964): 279–296. Miller, Norma P. "Tiberius Speaks: An Examination of the Utterances Ascribed to Him in the Annals of Tacitus." The American Journal of Philology 89 (1968): 1–19. Momigliano, Arnaldo. "The First Political Commentary on Tacitus." The Journal of Roman Studies 37 (1947): 91–101. Murgia, C. "The Date of Tacitus' Dialogus." Harvard Studies in Classical Philology 84 (1980): 99–125. Murgia, C. "Pliny's Letters and the Dialogus." Harvard Studies in Classical Philology 89 (1985): 171–206. Oliver, Revilo P. "The First Medicean MS of Tacitus and the Titulature of Ancient Books." Transactions and Proceedings of the American Philological Association 82 (1951): 232–261. Oliver, Revilo P. "The Praenomen of Tacitus." The American Journal of Philology 98 (1): (Spring, 1977), pp. 64–70. Persival, J. "Tacitus and the Principate." Greece & Rome, Vol. 27 (1980), pp. 119–133. Reid, James Smith. "Tacitus as a historian." The Journal of Roman Studies 11 (1921): 191–199. Rutland, L. "The Tacitean Germanicus. Suggestions for a re-evaluation." Rheinisches Museum 130 (1987): 153–163. Sage, M.M. "Tacitus and the accession of Tiberius." The Ancient Society 13/14 (1982/83): 293–321. Shatzman, I. "Tacitean rumours." Latomus 33 (1974): 549–578. Shotter, D.C.A. "Tacitus, Tiberius and Germanicus." Historia 17 (1968): 194–214. Syme, Ronald. "How Tacitus Wrote Annals I-III," in Idem, Roman Papers Vol. 3. Oxford: Clarendon Press, 1984. 1014–1042. Syme, Ronald. Tacitus. Volumes 1 and 2. Oxford: Oxford University Press, 1958, (reprinted in 1985 by the same publisher, with ISBN 0198143273, is the definitive study of his life and works. Talbert, R.J.A. "Tacitus and the Senatus Consultum de Cn. Pisone patre." The American Journal of Philology 120 (1) (1999): 89–97. Townend, G.B. "Cluvius Rufus in the Histories of Tacitus." The American Journal of Philology 85 (1964): 337–377. Walker, B. The Annals of Tacitus: A study in the writing of history. Manchester: Manchester University Press, 1952. Wharton, D.B. "Tacitus' Tiberius: The State of the Evidence for the Emperor’s Ipsissima Verba in the Annals." The American Journal of Philology 118 (1997): 119–125. This page was last modified on 11 November 2015, at 16:14.